The fold-down shelf serves as a mixing station or display area for your best-looking bottles and barware. Friends have declared your craft cocktails works of art. So we suggest placing your tools and materials where they belong: on the wall. 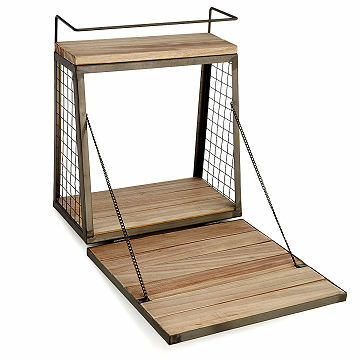 Made with Paulownia wood and raw metal, this compact, industrial-style bar features a fold-down shelf, which can serve as a mixing station or display area for your best-looking bottles and barware. Line the exposed top shelving with recipe books, potted herbs, or favorite fancy bitters. After the party, close up shop to stow all your supplies inside. It's a clever design for smaller spaces, and for those whose bar carts overfloweth. Made in China. Dust regularly, wipe clean with damp cloth. We were excited when we found this modern-looking, attractive and functional Murphy Bar. Purchased for our daughter (29 yo) as a housewarming gift. Took us 3 times to be able to get an attractive bar... and we had to do some work to make it happen! Customer Service gets 4+ stars for being very responsive and replacing the first two defective bars - very noticeable stains, glue and gouges in the wood that would be prominently showing when the bar is closed up! When the 3rd bar arrived still with noticeable imperfections. We threw up our hands and ended up having to do some sanding, re-staining and replacing of the boards. I do not recommend purchasing this product, HOWEVER, I highly recommend Uncommon Goods - as I have purchase other items that I have been extremely satisfied with - plus, for all of the trouble with this purchase and the delays, they gave me a $20 gift certificate toward a future purchase. We have a small studio apartment downtown and this was the perfect solution for a bar area that we always wanted despite not having the space. Everyone that comes over always comments on how cool and different it is - definitely a conversation piece. Well-made and looks impressive. We're looking forward to showing off our new liquor cabinet at Thanksgiving and an annual gathering of friends. It holds several regular size liquor bottles and coasters, providing ample space to make and mix drinks. We put four rocks glasses on the top rack and love the way it looks open and closed. Coukdn't be happier with this purchase. We live in a two bedroom apartment in Manhattan, where every square foot counts. This floating bar is versatile and can be used to store other kitchen items. We opted to put a couple of our best liquor bottles on the side facing into the apartment and keep other items behind them for appearances sake. I needed a little extra "counter" space and somewhere to store the few bottles of liquor kept on hand. This fits perfectly at the end of the counter in my galley kitchen. Doesn't take up too much space and looks great closed or open!